Courtesy of Better Homes of Southern California, Christopher Ritter. 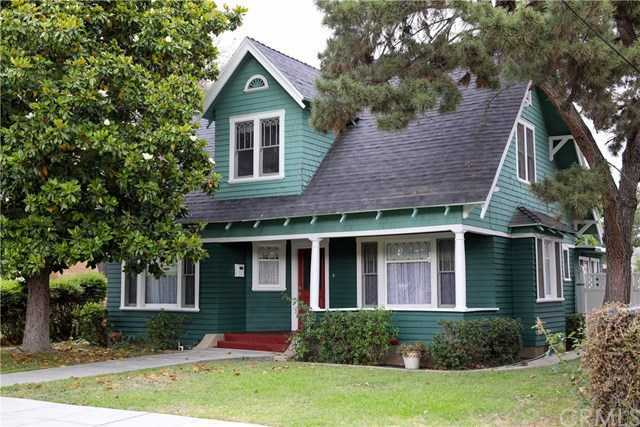 What an INCREDIBLE opportunity to own this Vintage Craftsman Style Home located in the Historic Downtown area of Riverside. Built in 1918, this classic cultural home has 4 bedroom 2 bathroom home features an awesome front porch that you can sit and enjoy the beauty of this classic street. Hardwood flooring throughout this entire home. Downstairs there is a library with a stunning wood built-in shelving and drawers, a family room, dining room, and an extra bonus room that boasts a closet in which you could close it up to make a fourth bedroom! This home even as an original cooling area with brick off the kitchen, that is so historic! Upstairs bathroom includes a gorgeous clawfoot tub. The lot size of this home is grand and the backyard is extensive to host weekend fun with friends and family. If you have a yearning for historic and character-filled homes, this is the one for you. So much history in this area, close to the world famous Mission Inn, The Food Labs, Mount Rubidoux, Fairmount Park, Riverside coffee shops, Farmer’s market and more! Please, send me more information on this property: MLS# IG19084091 – $440,000 – 3364 Brockton Avenue, Riverside, CA 92501. I would like to schedule a private showing for this property: MLS# IG19084091 – $440,000 – 3364 Brockton Avenue, Riverside, CA 92501.